How to raise Your Rates and Increase Your Bookings. Discover an alternative to competing on price so you can attract all the clients you need to get your business buzzing. So you've set up a massage practice. You rent a room, by the hour or the month. You know how much you need to earn to pay the rent and bills and how much you need to take home. And you plan to increase that take home amount. Then #CheapMassage sets up down the road from you. And they're charging €20 an hour for a massage. Your hourly rent is more than that, you can't compete. And you don't want to compete, you want to earn what you're worth. The good news is you don't need to compete on price. You CAN charge a fair price and get all the bookings you need. Even with #CheapMassage all over Facebook with their latest offer. Why it's a Bad Idea to Lower Your Prices to Attract Clients. How to Encourage Your Clients to Re Book and Tell Their Friends. How to Attract New Clients Without Lowering Your Prices. Why it's a bad idea to lower your prices to attract more clients. So #CheapMassage are wallpapering the town with posters and popping up on Facebook every 5 minutes. The thought of not lowering your prices immediately sends you into a panic. If you don't lower your prices to compete, won't you loose all your clients?? Won't anyone looking for a massage in the area to for the cheaper option? The answer is no, for a few reasons. When it comes to health and well being, price is not the only, or even the main, consideration. Why on earth would clients pay €60 for a treatment when they can get it for €20? Because they're not buying a massage or a facial or whatever. They're buying a solution to pain or stress. They're buying long term good health. They're buying an experience. And they want the best they can afford. #CheapMassage is not necessarily #AwfulMassage. They could be excellent therapists trying to make a living. The problem is, you hear "Cheap" and you think "Second Rate". You may wonder why it's cheap, what is it missing? Are the therapists unqualified or inexperienced? How low can you go and still make a living? How long before you become resentful? Before you loose the love of your therapy? How long before you're exhausted and broke and go back to the desk job? Your therapies and your client care are top notch. But you do need to stand out, to make your therapies extra special. One fantastic way to do this is to offer mini treatments, or add ons, to enhance your usual treatments. Maybe you often add some calming Reiki to your reflexology treatment, or include a lovely neck and shoulder massage with your natural facial. But of course you don't say anything about it, and naturally you don't charge. Because it didn't cost you any money or effort to train in these therapies, did it? Shout about these lovely mini treatments that you have been adding for free. Describe how they will benefit your clients. For instance, "Body Brushing" on a menu wouldn't have me rushing to book a treatment. But, "Body brushing to increase energy and give the skin a healthy glow" will get me reaching for my phone. Feature them in your menu and specials, include them in your loyalty scheme, even (gasp!) charge for them. 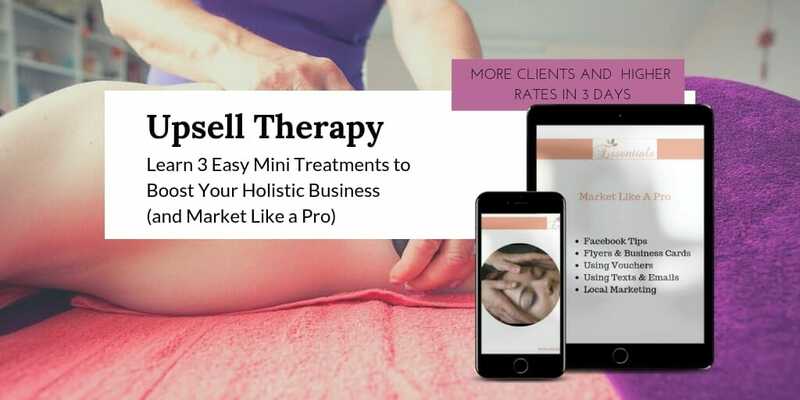 There are so many ways you can use your lovely mini treatments to encourage your clients to rebook, give fantastic results AND increase your income. And this will cost you little or nothing and take very little time. For more tips on encouraging clients to re book, check out my other post 5 Ways to Encourage Your Clients to Re Book. So that's great when you have clients already. What if you have hardly any? Or none at all, because you're just starting? How do you let new clients know you can help them with the back ache, the anxiety or other issues they have? 1. Testimonials are fantastic. On your website, on Facebook, in your printed brochures and flyers/rack cards. No clients to give testimonials? What about the people who were your case studies while you trained? Or could you give some treatments to your friends and ask them to put a testimonial on Facebook for you? 2. Put some brief posts on social media about your clients experiences. Maybe a client with insomnia is sleeping much better. Maybe someone with sinusitis has had amazing relief. Or even post about the results your therapy is well known for with examples and case studies. Reflexology, for instance is fantastic for fibromylagia, aromatherapy has almost magical results for PMT. 3. Put some pictures on social media and your website of your therapy room all set up for a treatment. A picture speaks a thousand words after all. Maybe you're concerned about how this will work. You're living in the real world and you have bills to pay. Surely you have to keep your prices in line with every other therapist out there? Let me share some of the experiences my students have had. Two of my previous students share a therapy room. Both are excellent therapists, both have received much the same training. One constantly offers reduced rates and is fully booked. The other charges the industry average of €60 per hour. And is fully booked. Another past student started sharing a room with a well established therapist. The other therapist charged above average rates because she got above average results. My student also got excellent results and had lots of clients re booking with her. But she was afraid to raise her prices in case she got fewer bookings. They decided it made sense to charge similar rates. My student raised her prices, lost none of her clients and is still attracting new clients. There are lots of ways to attract more clients and fill your appointment book without lowering your prices. Why not try some of the tips from this post, it will really help your business. Like to upgrade your therapies and increase your bookings in 10 days? Upsell Therapy online course is on special offer for a limited time. Learn 3 super easy, super effective mini treatments (Step by step video tutorials). 7 outside the box ways to promote your therapies to new clients. 10 day road-map helping you to complete the course, implement what you learn and get quick results. Price will rise to €97 at midnight on 14th May.